"Senator" and "Sen." redirect here. For other uses, see Senator (disambiguation) and Sen (disambiguation). This article is about the type of legislative assembly. For other uses, see Senate (disambiguation). A senate is a deliberative assembly, often the upper house or chamber of a bicameral legislature. The name comes from the ancient Roman Senate (Latin: Senatus), so-called as an assembly of the senior (Latin: senex meaning "the elder" or "old man") and therefore allegedly wiser and more experienced members of the society or ruling class. Thus, the literal meaning of the word "senate" is Assembly of Elders. Many countries have an assembly named a senate, composed of senators who may be elected, appointed, have inherited the title, or gained membership by other methods, depending on the country. Modern senates typically serve to provide a chamber of "sober second thought" to consider legislation passed by a lower house, whose members are usually elected. Most senates have asymmetrical duties and powers compared with their respective lower house meaning they have special duties, for example to fill important political positions or to pass special laws. Conversely many senates have limited powers in changing or stopping bills under consideration and efforts to stall or veto a bill may be bypassed by the lower house or another branch of government. The modern word Senate is derived from the [Latin] word senātus (senate), which comes from senex, “old man”. The members or legislators of a senate are called senators. The Latin word senator was adopted into English with no change in spelling. Its meaning is derived from a very ancient form of social organization, in which advisory or decision-making powers are reserved for the eldest men. For the same reason, the word senate is correctly used when referring to any powerful authority characteristically composed by the eldest members of a community, as a deliberative body of a faculty in an institution of higher learning is often called a senate. This form adaptation was used to show the power of those in body and for the decision-making process to be thorough, which could take a long period of time. The original senate was the Roman Senate, which lasted until at least AD 603, although various efforts to revive it were made in Medieval Rome. In the Eastern Roman Empire, the Byzantine Senate continued until the Fourth Crusade, circa 1202–1204. 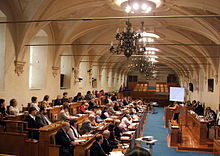 Modern democratic states with bicameral parliamentary systems are sometimes equipped with a senate, often distinguished from an ordinary parallel lower house, known variously as the “House of Representatives”, “House of Commons”, “Chamber of Deputies”, “National Assembly”, “Legislative Assembly”, or "House of Assembly", by electoral rules. This may include minimum age required for voters and candidates, proportional or majoritarian or plurality system, and an electoral basis or collegium. Typically, the senate is referred to as the upper house and has a smaller membership than the lower house. In some federal states senates also exist at the subnational level. In the United States all states with the exception of Nebraska (whose legislature is a unicameral body called the “Legislature” but whose members refer to themselves as “senators”) have a state senate. There is also the US Senate at the federal level. Similarly in Argentina, in addition to the Senate at federal level, eight of the country's provinces, Buenos Aires, Catamarca, Corrientes, Entre Ríos, Mendoza, Salta, San Luis (since 1987) and Santa Fe, have bicameral legislatures with a Senate. Córdoba and Tucumán changed to unicameral systems in 2001 and 2003 respectively. In Australia and Canada, only the upper house of the federal parliament is known as the Senate. All Australian states other than Queensland have an upper house known as a Legislative council. Several Canadian provinces also once had a Legislative Council, but these have all been abolished, the last being Quebec's Legislative council in 1968. In Germany, the last Senate of a State parliament, the Senate of Bavaria, was abolished in 1999. Senate membership can be determined either through elections or appointments. For example, elections are held every three years for half the membership of the Senate of the Philippines, the term of a senator being six years. In contrast, members of the Canadian Senate are appointed by the Governor General upon the recommendation of the Prime Minister of Canada, holding the office until they resign, are removed, or retire at the mandatory age of 75. The Senate of Finland was, until 1918, the executive branch and the supreme court. The Senate of Latvia (lv) fulfilled a similar judicial function during the interbellum (1918-1940). In the Bundesländer (Federated States) of Germany which form a City State (in German: Stadtstaat), i.e. Berlin (Senate of Berlin), Bremen (Senate of Bremen) and Hamburg (Senate of Hamburg), the senates (Senat in German) are the executive branch, with senators (Senator) being the holders of ministerial portfolios. In a number of cities which were former members of the Hanse (a medieval confederacy of port cities mainly at the shores of the Baltic Sea and the North Sea), such as Greifswald, Lübeck, Rostock, Stralsund, or Wismar, the city government is also called a Senate. However, in Bavaria, the Senate was a second legislative chamber until its abolition in 1999. In Scotland, judges of the High Court of Justiciary are called Senators of the College of Justice. In some, mostly federal countries with a unicameral legislature, some of the legislators are elected differently from the others and are called senators. In federal countries, such senators represent the territories, while the other members represent the people at large (this device is used to allow a federal representation without having to establish a bicameral legislature); this is the case with St. Kitts and Nevis, Comoros and Micronesia. In other, non-federal countries, the use of the term senator marks some other difference between such members and the rest of the legislators (such as the method of selection); this is the case with the States of Jersey, Dominica's House of Assembly and the Saint Vincent House of Assembly. In Wales, the National Assembly for Wales debating chamber is called the Senedd, pronounced 'Seneth'. An academic senate is the governing body of some universities. In Greece during the early stages of the Greek War of Independence, various local legislative and executive bodies were established by the Greek rebels. Two of them were styled "senate": the Peloponnesian Senate and the Senate of Western Continental Greece. ^ A Greek Senate was reestablished in 1927, and abolished again in 1935. ^ The Kenyan Senate and House of Representatives were combined into a single National Assembly, under the 2010 Constitution, the Senate is the upper house, with the National Assembly becoming the lower house. ^ A South African Senate was reconvened between 1994 and 1997, before being replaced by the National Council of Provinces. ^ a b c The Philippine Senate was abolished and restored twice. A new constitution in 1935 abolished the Senate but an amendment in 1941 restored it in 1945. In 1972, the legislature was closed, and a passage of a new constitution in 1978 confirmed the abolition of the Senate; an approval of a new constitution in 1987 restored it. ^ a b c The 1844 Constitution of the Republic of Costa Rica Archived 2011-01-24 at the Wayback Machine provided for a Senate; the Constitution of 1847 Archived 2014-11-29 at the Wayback Machine, which replaced it, established a unicameral legislature. The Senate was reestablished by the Constitution of 1859 Archived 2014-11-29 at the Wayback Machine; the country reverted to unicameralism with the adoption of the 1871 Constitution Archived 2014-11-29 at the Wayback Machine. Costa Rica briefly restored the Senate and bicameralism with the adoption of the 1917 Constitution Archived 2014-11-29 at the Wayback Machine, but that constitution was abrogated in 1919, whereupon the 1871 Constitution was restored; it remained in effect until 1949, when Costa Rica adopted its present Constitution, which provides for a unicameral legislature. ^ The 1841 Constitution of the Republic of El Salvador established a bicameral legislature with a Chamber of Deputies and a Senate. The 1886 constitution replaced the bicameral legislature with a unicameral one. ^ Bicameral Legislatures: An international Comparison. Betty Drexhage. The Hague. 2015. ^ Levillain, Philippe (2002). The Papacy: Gaius-Proxies. Psychology Press. p. 1047. ISBN 978-0-415-92230-2. ^ See Senate of Berlin, Senate of Bremen and Senate of Hamburg.